Here are some kind words from groups that have stayed with us in the past. Coast Christian School Group Photo On Out Front Deck! Just wanted to tell you that we enjoyed our stay in both houses tremendously! Everything suited our needs! The hike you told us about was nice! Saucy Mama's Pizza was great! Richard helped us get reservations at the bowling alley. Overall, it was a successful retreat for us. I just led a 50 person college ski trip to Big Bear and we stayed at the hostel over MLK weekend. It was an awesome experience, the place was perfect for big groups. There are two house and we filled both of them. We even cooked at the house for everyone, between the two kitchens they have almost everything a big group would need, with a little improvisation. Grayson worked so well with us and was always happy to talk to me all the times I called with an extra person. It was way clean and really homey. All our participants loved it and made comments about how awesome of a place it was. I've only hosteled in South America, but in comparison this is the best hostel I've ever been to. For a group it was better than any home you could rent in Big Bear and I it was way cheaper too!!! GO try it out yourself! It's awesome. "Thank you for the awesome cabins at Big Bear Lake. Everyone in the group enjoyed every second spent in that house." This summer we went to Big Bear with our group of about 40 and stayed at the Big Bear Hostel. It was a great facility. We rented out both houses. The bedrooms were nice. They had all the comforts from home including two nice kitchens. The game room was great. Our students loved that. We took advantage of their outside courtyard and BBQ. It was a great place to hang out and chill. One of the best parts was that it is so close to everything. The lake is across the street and there is this park that we played at during the day. Also the downtown shops are about one block away. We walked everywhere. Plus, the price wasn’t bad either. It was cheaper than anything else and we had a great time. 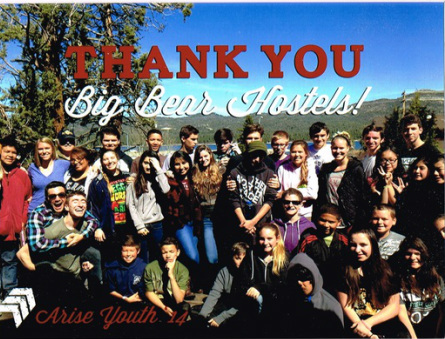 We are definitely using Big Bear Hostel next year. We wanted to thank you again for providing us with an INCREDIBLE Big Bear experience. Everything went so smoothly and even better than planned. Our family reunion trip to BigBearGroups.com Cabin rentals was outstanding! Our group consisted of 50 people ranging from 1 yr to 68 yrs. We ALL fit with room to spare and no problems. eating, telling stories around the fire pit, and roasting S'mores. I have to mention the walking distance to the lake, and to the village, is a huge convenience. Thank you for having us again. The kids had a blast and the hostel continues to provide exactly what we are looking for. I appreciate all you do and provide and I am extremely grateful to have found your location some years back.